Maui developer Kent Smith was among the partners celebrating the groundbreaking on Maui yesterday of the state's largest wind farm. MAALAEA, Maui » As a golfer, Kent Smith usually doesn't like the wind. But as developer of the state's largest wind farm, he loves it. In gusty conditions yesterday near Maalaea, Smith was smiling as he, other investors and dignitaries celebrated the groundbreaking of the wind farm project. It is expected to decrease oil imports and save Maui households about $120 each a year. "It's refreshing to be involved in this project," Smith said. "This is an opportunity to create a crop. ... In this case, the product is energy." When it begins scheduled operation in January, the Kaheawa Wind Power project is projected to provide up to 30 megawatts, or 9 percent of Maui Electric Co. power. The 20 turbines will be built along the southwest slope of the West Maui Mountains from 1,900- to 3,000-foot elevation, where winds have been recorded blowing at up to 50 mph. Maui Electric President Ed Reinhardt said the wind farm will allow his firm to reduce its consumption of imported diesel oil by an estimated 160,000 to 240,000 barrels yearly. Gov. Linda Lingle said the project is helping Maui to achieve a statewide goal of 20 percent renewable energy use by 2020. With the addition of the wind farm, about 15 percent of Maui Electric's power will be provided by renewable energy. "That's an outstanding achievement. ... This is only the beginning," Lingle said. "This cannot end." The development of alternative energy in Maui County has had its skeptics, especially after some mishaps in the 1980s. Molokai's new biomass plant broke down, and the island's utility had to rely on emergency diesel engines to provide power to customers. In a test project on Maui, a blade from an experimental wind turbine broke off on the Maalaea flats. Kaheawa Wind Power officials note the wind turbines are being made by General Electric, a firm with more than 7,000 wind turbine installations worldwide. Keheawa Wind's principal partner is the Boston-based UPC Wind Partners LLC, an entity that has developed wind farms providing 700 megawatts of electricity in Italy, the partnership said. The firm plans to spend about $1 million to lessen the effect on endangered birds, including the development of pens for the protection and release of endangered nene birds. Na Kupuna O Maui, a native Hawaiian group, is working with the developer to carry out a plan to re-establish the native forest at lower elevations. 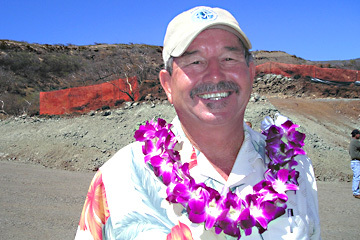 Na Kupuna spokesman Ed Lindsey said some sacrifice of the cultural environment is occurring. But he said his organization's main goal is to make sure the cultural aspects are protected. "We're on track with them," he said. Mike Gresham, one of the partners, said a pricing agreement between Kaheawa Wind and Maui Electric allowed the sale of about 70 percent of the power at a fixed price now below the current cost of oil-generated power. The savings from the agreement are being passed onto the utility. Gresham said the windmills will be visible from Kihei and Wailea, "but you're eight miles away, so the profile is very small."